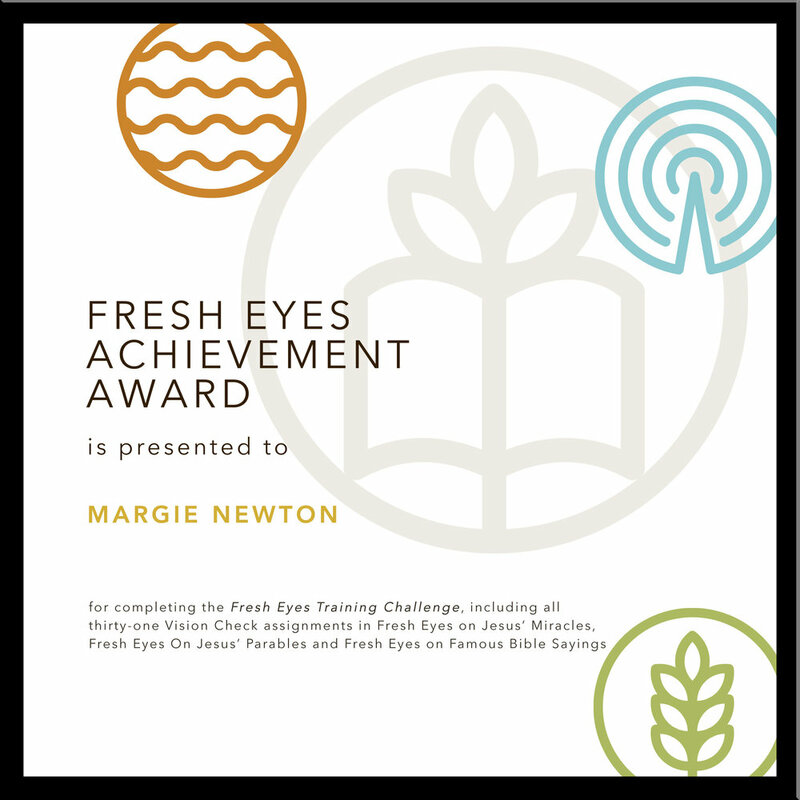 Finish one, two or all three “Fresh Eyes” books and the Vision Check assignments outlined below and qualify for increasing levels of rewards. Please note your zip code so we can create an interesting map showing where our participants are located generally. Thank you for accepting the Fresh Eyes challenge and registering. You will shortly receive by email a unique web address where you will find your personal Progress Tracker form. Read one, two or all three books in the Fresh Eyes series. Complete the Vision Check exercise at the end of each chapter. Go to dougnewton.com/fresh-eyes-videos and find the Vision Check page related to the chapter you just read. Read the technique description and watch the video of Doug Newton’s insights for that chapter’s Vision Check exercise to compare your thoughts to his. As you complete each Vision Check exercise use your assigned web address to go to your online Progress Tracker and record the date and write a brief summary (75-150 words) of your insights for that chapter’s Vision Check exercise. As you complete each book, go to the tracking form page (link is found in the instruction section of your personal Progress Tracker) and fill out a completion form for that book indicating whether it is your first, second of third book and claim your corresponding reward. We will check your Progress Tracker and confirm your eligibility to receive the reward(s) for your level. 8.5 x 8.5 mounted on matte board with picture hook included for wall mounting. LEVEL ONE: Complete the above conditions for one book. LEVEL TWO: Complete the above conditions for two books. LEVEL THREE: Complete the above conditions for three books. Access to 31 beautifully designed Fresh Eyes kEy-cards with an encouraging key thought from each chapter with scores of uses.